Applying to high school in New York City has long been a daunting process, especially for students who don’t have top grades or test scores. 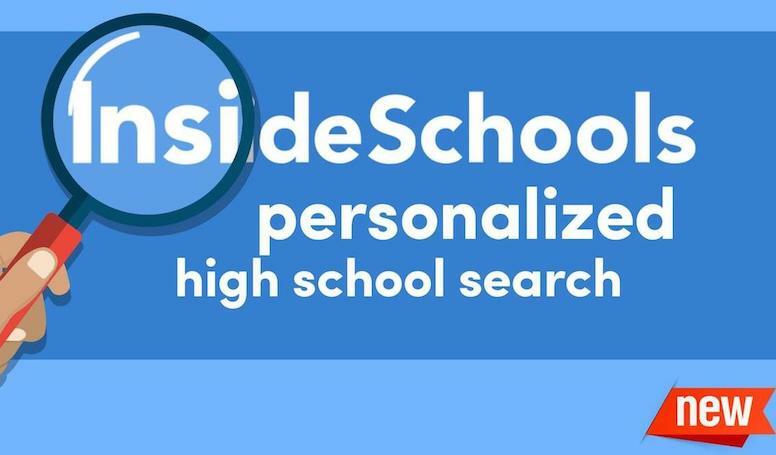 Now, InsideSchools has a new tool for 8th-graders (and the grown-ups who help them) to find which of the city’s 700 high school programs may be right for them. All you have to do is answer a few questions online and you'll get a personalized list of schools, tailored to your academic record and to whether you are willing to travel, to take an exam, or to go for an audition. You can look at photos, read our expert reviews, find out if a school is safe, or if kids graduate on time—all on your cellphone or laptop. Part of the problem with the high school application process is that everyone seems to want to go to the same schools, and those schools mostly limit their admissions to tippy-top students. But we have identified hidden gems for all kinds of students, whatever their strengths and weaknesses. We’ve crunched the numbers to find schools that prepare students well for college—even if they enter 9th grade with weak academic skills. We have special searches for students with disabilities, students who are still learning English, and those who need a fresh start and want to transfer. We also give you a rough estimate of your chances of admission, by showing which schools have tons of applicants and which have fewer. This way, you can apply to schools that are a reach, but also include some where you have a better chance of getting in. You can sort the results various ways: by how well students are prepared for college (that is, how many can attend CUNY without taking remedial classes), by the distance from your home, or by our staff recommendations based on our school visits and our analysis of the data. We call our recommended schools “staff picks” or “noteworthy" schools. Some of these are well-known and some are hidden gems. Still others are too new to have a track record but are off to a terrific start. We have updated 250 high school reviews so far this year and plan to continue updating school profiles in the fall. Another new feature: You can create a “user account” to save your search and make a list of your favorites. Sign up today. InsideSchools, a project of The New School’s Center for New York City Affairs, has been a trusted, independent source of information about the city’s schools since its founding in 2002. We have conducted thousands of visits to New York City schools and interviewed a countless number of parents, teachers and administrators. The high school guided search was made possible with grants from the Walton Family Foundation, the Booth Ferris Foundation, Deutsche Bank and New York Community Trust.